Helping a friend. As mentioned previously... the purpose of this blog is to post information that's easily referenced. 2. This is a zipped up .ISO file and needs to be burned to a CD. a. Generally, most computers today have built-in burner software. 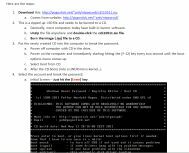 b. Unzip the file anywhere and double-click the cd110511.iso file. c. Burn the image (.iso) file to a CD. 3. Put the newly created CD into the computer to break the password. a. Power off computer with CD in the drive. b. Power on the computer and immediately starting hitting the [F-12] key every two second until the boot options menu comes up. a. Initial Screen – Just hit the [Enter] key. b. Next you see the following line. Select:  – Just hit the [Enter] key. c. Next you see [Windows/system32/config] – Just hit the [Enter] key. d. Next you see : – Just hit the [Enter] key. e. Now you see  : again (for option Password reset…) – Just hit the [Enter] key. f. Next we select the account to change. [Adminstrator] – Just hit the [Enter] key. g. Next we blank (clear) the password. Select: [q] > - Type 1 and hit the [Enter] key. h. Now it’s time to quit. Type ! and hit the [Enter] key. Type q and hit the [Enter] key. Type y and hit the [Enter] key. Type exit and hit the [Enter] key to exit program. i. Power off computer: Hold the power button for 6-8 seconds until it turns off. j. Power on and the password for the administrator account should be blank. 5. The same steps can be followed for any account on the system.